Meanwhile, CEO pay just keeps climbing and climbing and climbing (and climbing and climbing and climbing and climbing and climbing and climbing). This inequality is destabilizing our economy. Stagnant wages, with Republicans in Congress blocking an increase of the minimum wage. Laws prohibiting cities and counties from raising the minimum wage in Republican states like Oklahoma. Republicans in Congress obstructing restoring unemployment benefits for the long-term jobless. The Paycheck Fairness Act, which addresses unequal pay between men and women, being filibustered by Senate Republicans. I earned about $12,000 last year as a full-time employee. These poverty wages force my family to receive public assistance. Currently, we are enrolled in the public health care program for low-income families, and the Women, Infants and Children program for my infant daughter. 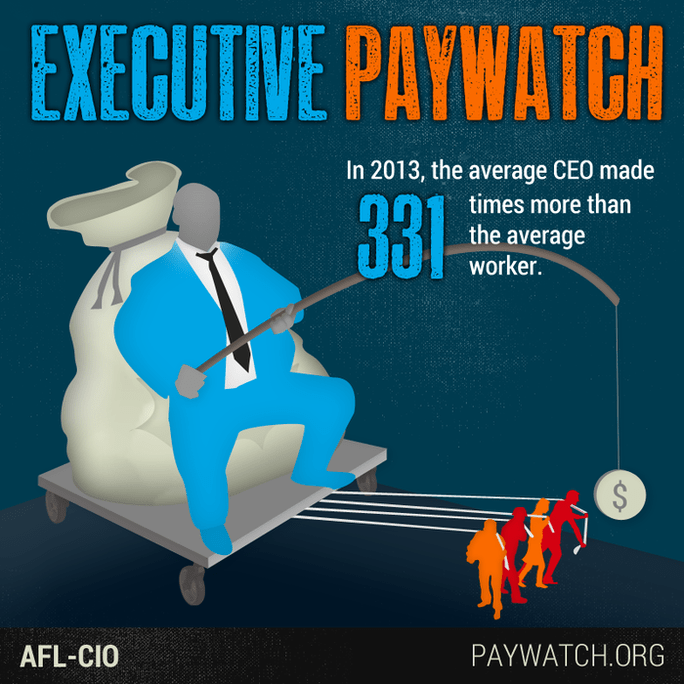 Check out the CEO-to-Worker Pay ratio in your state. The 2010 Dodd-Frank Wall Street reform legislation required the Securities and Exchange Commission (SEC) to come up with a rule requiring companies to disclose the ratio of CEO compensation to worker compensation. The SEC dragged its feet through 2010, and then it dragged its feet through 2011, and then it dragged its feet through 2012, and then it dragged its feet through 2013, and then in September the SEC belatedly proposed a rule. Seven months later they are still dragging their feet on implementing this rule. Minimum wage workers are not just teenagers bagging groceries at the corner store. They’re not all go-getters on the first rung of the ladder to the American dream. They are mostly women, disproportionately of color and in service industries where there’s no way up or out. They’re the men and women who hand you your change, clear off your tray and say “have a nice day” on your way out the door. They haven’t had a raise in years. In fact, their pay has gone down because it’s not indexed to inflation. Join The Nation and Campaign for America’s Future in calling on Congress to pass the Fair Minimum Wage Act. Also Campaign for America’s Future has set up a special phone number – (661) BOEHNER – that will connect you directly to House Speaker John Boehner, so you can demand he allow a vote on the Senate bill to restore unemployment benefits for the long-term jobless.